Since Louie became a massive critical hit for FX, other networks have followed its lead, handing over the keys to a singular voice for a show with a defined point of view. Each of these shows say something about who their creators are, where they came from, and where they are going to go. They aren’t the voices of their generations—to paraphrase a widely parroted line from the first season of Girls, Lena Dunham, herself a member of the TV Auteurs Club—but a voice in a generation, their views reflected in those people who happen to look like them or talk like them or live like them. Showrunners always have ultimate control when it comes to TV, but these creators also star, not just acting as the voice, but the face, of their own work. These shows don’t garner massive ratings, but Comedy Central, for example, is probably pretty happy with the Emmys Amy Schumer picked up for Inside Amy Schumer this year. What’s most important is that their artistic point of view exists and they can articulate that singular vision better than everyone else. For its first auteur, Netflix handed those keys to Aziz Ansari. And it was a smart move. 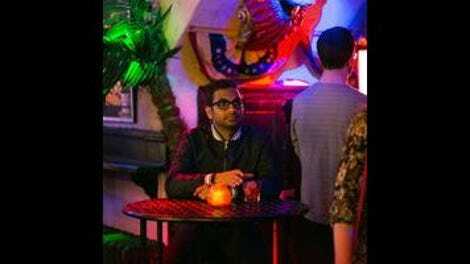 While Master Of None was co-created and cowritten by Ansari and Parks And Recreation writer Alan Yang, it’s Ansari that is the face of the show. Ansari and Yang use their freedom wisely, creating a show that is both funny and sweet, but more importantly has a point of view and a voice that is singular to its creator, even if in this case it’s creators. Dev’s dad says this during the second episode, “Parents,” an astounding piece of work that announces why Master Of None should exist. In the opening sequence, Dev and his buddy Brian (Kelvin Yu) blow off their fathers’ simple requests (computer help, fetching rice from the store) so they don’t miss the trailers or the movie trivia questions before the new X-Men movie. Each father flashes back to his youth and his immigration to the United States, thinking about how they came from India and Taiwan to become successful New Yorkers, giving their sons the opportunities they were never afforded so those same sons could blow them off for seeing one of 15 X-Men movies (although, according to Brian, this one does make the top nine). “Parents” isn’t a tragedy; instead, it shows the simple, inescapable divides created by immigrants and their first-generation-American children, and how those divides are smaller than they appear. Dev’s dad may chide his son for the freedoms he takes for granted, but he also enjoys those same freedoms. This is something that Louie is never going to tackle because Louis CK can’t, and that’s totally okay. But Master Of None isn’t great because it deals with race. It’s great because of how it deals with race. It’s not the overt point of the show, nor is it heavy-handed. It’s a part of Dev’s life, both as the son of an immigrant and as an actor of color trying to get work. 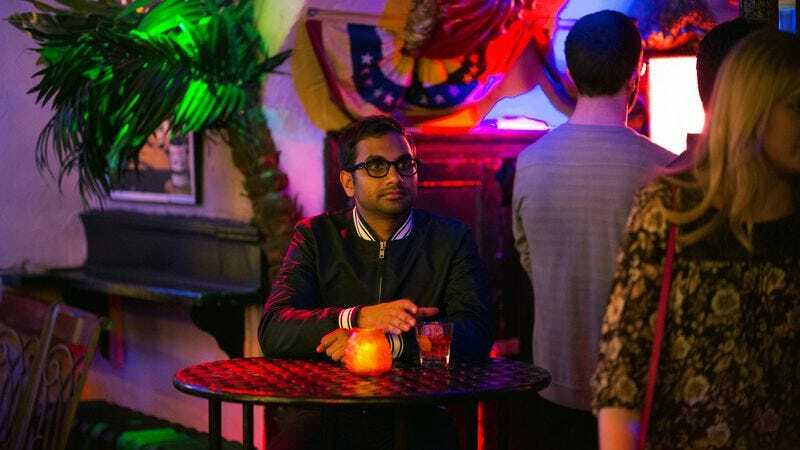 Race isn’t the only theme in the show, and in many ways this is where the perspective of Ansari’s stand-up and his recent book, Modern Romance, come into play. Dev’s squad includes Taiwanese-American Brian, black lesbian Denice (Lena Waithe), and white, perpetually single Arnold (Eric Wareheim), whose conversations revolve predominantly around the many ups and downs of Dev’s love life. His dalliances with a music publicist (former Saturday Night Live player Noël Wells) is one of the threads connecting Master Of None’s 10 episodes, and their relationship is an incisive look at dating in an era when asking several women out on a date at once involves just one text—as depicted in the third episode, “Hot Ticket.” “I’m a person, not a bubble in a phone,” Dev laments when he’s not getting the response he wanted, but that’s exactly how he’s treating everyone else. “Hot Ticket” is a complex episode, playing off broad jokes that eventually lead to a pay-off tinged with a sadness. (Harris Wittels, the Parks And Recreation writer who died in February, wrote the story.) It’s an episode that characterizes Master Of None, in a way, as a show with a voice that gets stronger and more assured as it progresses. Ansari and Yang come out of the gate strong, showcasing who they are and how they view the world with a clarity and assuredness that few others have been able to master.